Day 01: Hanoi – Mai Chau. (Distance: 180 km). In the morning we take a short bus drive the Ho Chi Minh Trail Museum on the outskirts of Hanoi. The museum is a great place to learn about the historic trail which we will ride on. After the visit to the museum we will jump on our Minsks and spend sometime to get familiar with the bikes. Now, let’s begin our adventure. 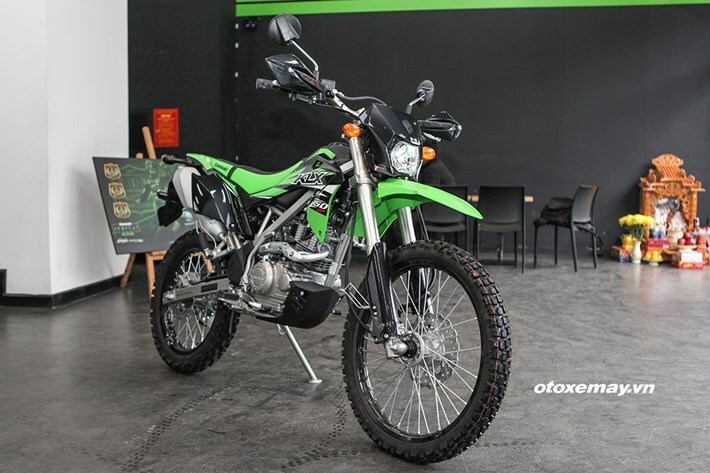 We will ride on Highway 6 passing extensive farming lands comprising a sea of paddy fields split by tree-lined roads punctuated by limestone karst scenery. 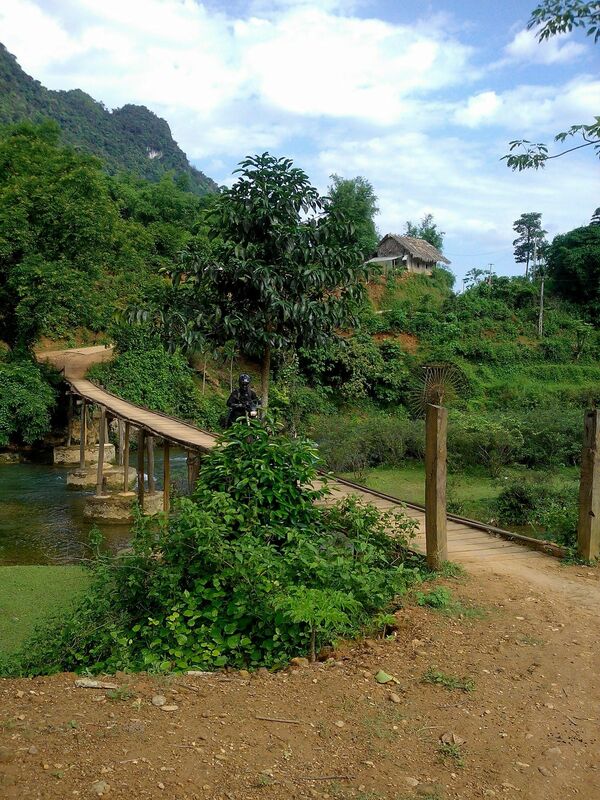 Day 02: Mai Chau – Vinh. (Distance : 268 km). Day 03: Vinh – Huong Khe. (Distance : 160 km ). Day 04: Huong Khe – Phong Nha – Dong Hoi (Quang Binh). (Distance: 210 km). Today’s ride is on a very quiet section of the new highway. 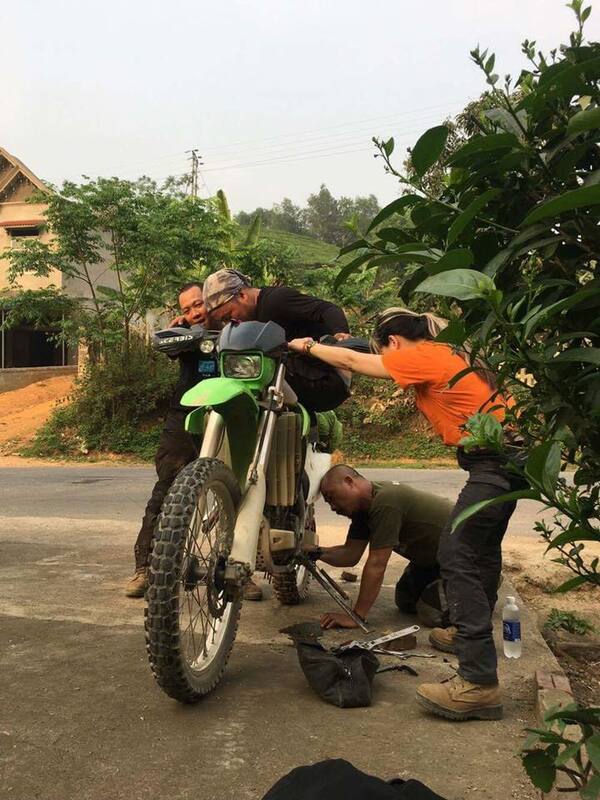 En route, you will come to Khe Ve Intersection and Pheo – the very first branch of the Ho Chi Minh Trail into Laos. Continuing on from Pheo, we will arrive in Phong Nha around noon. After lunch in local restaurant, we board a dragon boat to explore the famous Nature World Heritage Site of Phong Nha cave. Day 05: Dong Hoi – Dong Ha (Quang Tri). (Distance: 176 km). Today’s ride is also on the new, quiet highway. Along the way, we will have a short stop at Truong Son National Cemetery to pay respect to the soldiers who fought and died on the trail during the American War. After here we head to Dong Ha Town passing Ben Tat Bridge, built by the VC over the Ben Hai River. Dinner and overnight in Dong Ha town. Day 06: Dong Ha – Khe Sanh – A Luoi (Thua Thien Hue Province). (Distance : 200 km). Continuing west on Highway 9, we will climb into the Truong Son foothills. About 16km from Khe Sanh is the Dakrong Bridge and the road turns winding and narrow. A bit further, we will come to Huang Hoa, once known as Khe Sanh Base, which was established as a forward base by General Westmoreland near Laos to secure Highway 9. About 3km from Khe Sanh is Ta Con Airbase. Lunch in Khe Sanh and then head out across the famous Dakrong River Bridge on Rte. 14 Near the town of Ta Rut, we will stop for a visit with the Pa Co people and a walk through their village. From Ta Rut, you head over scenic Pe Ke Pass and then down to A Luoi for the night. Day 8: Hoi An – Beach leisure. Day 9: Hoian city tour. Hoi An, nestled on the banks of the Thu Bon River. Before the river silted up, Hoi An was one of the most important trading ports in Southeast Asia, and a center for East-West exchange and trade. The rooftops of Hoi An retain a magical old world Oriental feel and are a favorite subject for Vietnamese artists. In the early 1980s Hoi An’s ancient quarters and historical monuments came under the protection and restoration efforts of UNESCO and the Polish government. Time to hit the road again! We leave Hoi An in the morning and head to My Son, a world heritage site that is the Cham version of Angkor Wat. Most of the temples are dedicated to the Hindu god, Shiva, considered by the Cham as the founder and protector of their dynasties. From My Son, we will continue along the highway, busy at first, until the road shifts and becomes smaller, although paved. Then the drive becomes challenging, but a lot of fun and progress is far slower. We will continue driving along the river, but the road itself, new and not very busy, climbs up along a very steep valley with the river rushing below. The river below is dotted with unique rock formations and there are waterfalls along the way. Lunch will be in Dong Phu. After breakfast in local restaurant we continue Vietnam motorbike tour to the north on Highway 14 today on a bit of a bumpy section of the road to Kon Tum. Today is really a day to visit different minority villages. We will drive over Lo Xo Pass, making lots of stops along the way to meet De and Trieng minorities, who live along the Dak Po Ko river. Along the river are many amazing hanging bridges, built by the local people to cross to the opposite shore. Lunch will be in Tan Canh, and we can visit a village of Se Dang, before driving on to Kon Tum. Along the way, we also pass one of the key towns and battle sites of the Vietnam War – Dak To and outpost Charlie. This day we stop in sea lake near Pleiku, see rubber tree and coffee plantations, green pepper crops. Boun Ma Thout is famous for making the best Coffee in Vietnam, so this is the place to stock up and maybe enjoy a cup or two at a side walk cafe. In the morning we go to the majestic Dray Sap waterfalls, then in the afternoon we go to lak lake. Check in to the hotel then we visit the local Mnong Ethnic hill tribe. That evening enjoy a traditional music performance of the Mnong ethnic people. Day 14: Lak Lake to Dalat (170km). In the morning you have free time to perhaps ride an elephant or take a local boat across Lak Lake. Then we spend the rest of the day enjoying the beautiful landscape along the road to Dalat, arriving in the late afternoon. The tour ends on arrival at your hotel. Day 17: Muine- drive to Saigon. Overnight at the hotel in Ho Chi Minh. Day 18: Saigon – departure. Free time till transfer to the departure flight.